Not for this figure, but for repaints in general I would imagine RotV and SotM figures being acceptable. What about figures from waves that were reprinted or weren't highly sought after? I'm specifically thinking Wave 1, Wave 5/10. I'd be inclined to consider simple repaints of common squads (or a common hero) where the submitted custom was a unique hero, and where the custom had good reason for looking just the same as on existing unit. I might take exceptions to that, if a squad is less prevalent or more valuable, but that's a general baseline philosophy on repaints from one judge. I'm less inclined to accept a Repaint. If you look at the Official Repaints they are not exactly easy. Hawthorn has the shield and Nerak has shading and washing. Skahen is the easiest, with Woo being a bit harder. Also all of those end up looking very distinct from the units they are repaints of. It is worth noting these all come from Common Figures too. The Granit Guardians, Elite vipers and Quasquatch Warriors also look fairly distinct, but I think are also fairly involved Repaints, with washes and detail work. At that point may as well go down the unpainted road. To me most of the Unique heroes and Squads would look like Street Fighter Color Variants with a simple repaint, and would not look distinct enough. I could see a repaint of the Warriors of Ashra with the Head Dress would be the best option I could see, but even then I'm not so sure. The only repaint I think would be ok would be if you did an evil Raelyn . Just like in the Heroscape cartoon. You could paint it up to look just like that and use a Raelyn sculpt. I actually thought the repurposing of Abom as a Marro was pretty clever. However I would tend to want any repaints to be uniques, not uncommons. Totally agreed. I think it looks pretty great, but I don't think that's enough for SoV. I thought it was a great repaint, and the sculpt could work. Unlike Tyrian, though, it was a repaint that you couldn't fool around with. It looked demanding. Quality work, though, and I like the concept. Anywho, Executioner 616 seems to have killed the Marvel Universe, but does he have what it takes to explode his way into the SoV? Looking at his stats, 616 seems about right at 115. Deadly Strike is a powerful ability, but if you're just looking for a deadly striking beatstick, Migol's got a lot more going for him between his superior bonding option and survivability. That means you really need to be using 616's Remote Detonation to get the most out of him, which is how it should be. I love the idea of Isodora having executioner bots, makes perfect sense for a prison planet. Deadly strike really clicks for a Soulborg executioner too; it can represent either precision or brutality, or in this case a little of both. It's a little weird that he can turn other borgs into bombs when they can't explode on their own, but I picture it as some sort of unstable energy transfer (as seen in every 5th episode of Star Trek) or the like instead of him just sending a “will u xplde 4 me plz” text message. I kind of wish his personality was Ruthless instead of Tormenting, he is exploding his own teammates all the time after-all, but other than that, he's solid thematically. Making every Soulborg in your army into Andrew D. Kaboom is certainly unique if nothing else. Unsurprisingly, given his designer, 616 has all manner of combos and synergy to work with. A full bonding squad, full bonding common hero, limited bonding unique hero, and a bunch of other Soulborg bombs-in-waiting. Fortunately, none of his bonding options are amazingly powerful currently, so there is room for them to expand. I was most worried about Deathreavers actually, given their borderline broken power level, but as they effectively have a penalty on Detonation rolls I never found the pairing terribly powerful. They still make a nice back-up bomb option in a Zettian Infantry or Hoplitron build though, and it's not like any army is really made worse by having some rats around. Other than the rats, turning Zets or Hops (or Deathstalkers) into bombs can be useful, but it's hardly over-powered as you're paying for those bigger bangs with higher costs per figure and it's not something you can do but so often without screwing yourself over more than your opponent. The one thing I don't really care for is the extra 2 wounds on a 20+, it seems unnecessary and overly punitive to unique hero heavy armies, but it wasn't enough of a fun-killer for me to ax the Executioner over. I had a lot of fun with 616. He adds some fun options to the Deathborg faction without breaking anything, certainly a worthwhile addition to the game. I vote to induct Executioner 616 into the SoV. On the subject of SOV repaints: what about a Dumetef Guard? Orgsbane made this excellent repaint for the NW Customs team. He has a lot of subtle details but I think this could be a simple enough repaint for folks. Choose a figure to attack or chose Gald'rabok. Any figures adjacent to the chosen figure are also affected by Ice Storm Special Attack. Gald'rabok only needs a clear sight shot at the chosen figure. Roll attack dice once for all affected figures. Each figure rolls defense dice separately. Figures with the Cold Healing, Cold Regenerate, Snow Strength, or Glacier Camouflage Special Powers take no wounds when attacked by Ice Storm Special Attack. After taking a turn with Gald'rabok, if it is on at least one snow or ice space, remove 1 Wound Marker from this Army Card. As Utgar’s forces gain a greater foothold on Valhalla, his minions continued to search through the mystical lands for any advantage. During one expedition, the demon lord, Uvall uncovered an ancient sanctum in the ice caves of Thaelenk. Within the sanctum several rare tomes and enchanted items provided the means to summon a great demon that was once trapped by the Arch-Kyrie. Using the incantations of the books, and coupled with magic provided by other sorcerers, the seals were broken releasing Gald’rabok the Frost Reaver. While not mindless, Gald’rabok’s savagery is unmatched on the battlefield. The gigantic demon stands well over ten feet tall, with massive, muscled arms, fearsome talons and a crown of horns. When he is not tearing his opponents apart limb by limb, the ice demon unleashes mystical blasts of cold. These magical frost attacks contain razor-sharp projectiles of ice that can penetrate even the strongest armor. In addition, Gald’rabok can surround himself with a swirling storm of ice and snow which makes him remarkably effective against massed troops. As a Demon, Gald’rabok may receive Morgoloth’s DEMON LEADERSHIP movement bonus. As a figure that follows Valkrill with a range of 1, Gald’rabok may receive a Skull Demon’s VALKRILL ATTACK AURA attack bonus. As a small, medium, or large Relentless figure, Gald'rabok may be activated with the Death Knights UNHOLY BONDING. As much as I loved it, the marro was definitely a tough repaint, and I ended up sinking quite a few hours into it. 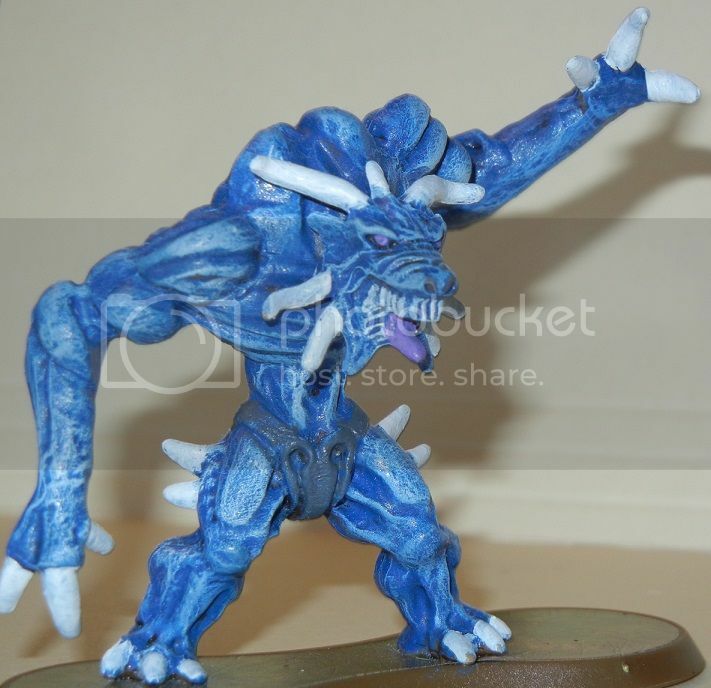 Obfuscatedhippo is right though, the ice demon is a very straightforward one, I'm willing to bet even someone who has never painted before would be able to make a good looking model out of it with just around 20 minutes of time spent on it, not including drying. I dunno. I like the intent, but that just looks like a blue Dumutef to me. Official repaints (and Tyrian) were all the same species or a single sort of creature (rockmen vs lava rockmen, for example). Demons can take different forms, but pretending that isn't a fiantooth is too much for me. I'm also not so sure people have extra Dumutefs to paint. It's been a long time since the road set was in print.